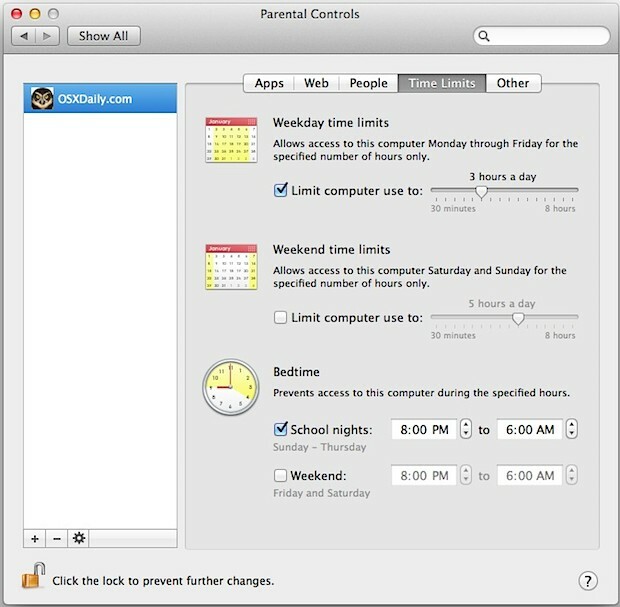 Mac OS X allows you to set time limits for computer usage by way of Parental Controls. 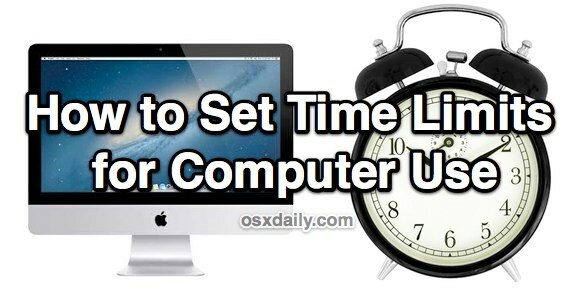 With the feature, you can set different limits to computer use for weekdays, weekends, and even set bed times, whereby the Mac would be unusable between some specified hours. This is obviously a good way to set computer use time limits for kids, but it can also be a handy way to force some self control on yourself if you struggle separating work from play, and otherwise just spend too much time on the computer. With Time Limits configured, the next time the user accesses that account they will be confined to the timing restrictions that were indicated. The “Limit computer use” options are generic in that a restriction of 3 hours a day can be used for a grand total of 3 hours a day at any time of the day. The “Bedtime” feature allows you to specify clock hours if you want the user account to only have access during specified hours. Parental Controls has a lot of other helpful options available too, like preventing certain apps from being used, limiting contact with certain people, profanity filters, and more. The name makes it obvious that the feature set is geared towards parents for their children, but I know several individuals who use different user accounts for separating their home and work lives, and also to limit distractions from apps like Twitter. Is there a way to have different timeschedules on different days. For example 1 hour on monday, no use on thuesday, 2 hours on wednesday etc, etc.